TVG will provide exclusive live coverage of the 2008 Claiming Crown when the 10th annual renewal of the $600,000 event, saluting North America’s top claiming horses, returns to Canterbury Park in Shakopee, Minninnesota, on August 2. TVG hosts Matt Carothers and Ken Rudulph will be on site at Canterbury Park, anchoring day-long coverage of Claiming Crown races and festivities. TVG’s popular “:58 Flat” program, airing live from 3:00-4:00 p.m. (ET), will also originate from Canterbury Park on August 2. In addition, TVG will offer promotional spots and other pre-event coverage of Claiming Crown during the week leading up to the event. Claiming Crown features seven races, with purses ranging from $50,000 to $150,000 and is open to horses that have started at least once in 2007-08 for claiming prices ranging from $7,500 to $35,000. The day’s featured event is the Jewel, a mile and one-eighth event on the main track with a purse of $150,000. Also on the program are two mile-and-one-sixteenth races on the turf, three six-furlong dashes on the dirt and a mile and one-sixteenth main track contest. 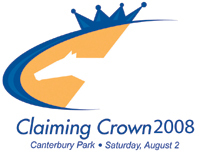 This year’s event will mark the eighth time that Canterbury Park has hosted Claiming Crown. Race sponsors for 2008 include Bremer Bank, John Deere, Daily Racing Form and Allied Waste Services. For more information and race histories, please visit www.claimingcrown.com.